Chicago’s South Loop has joined the nationwide effort to become more eco-friendly by cleaning up its neighborhoods and planting more greenery. Milesh Milan, founder of Ghabit said that for now, the organization is “focusing strictly on Chicago but as we grow we would like to have different communities. We focus on building relationships with organizations and schools. So that is why we started with Roosevelt University. Milesh, said he believes that making the world greener is only part of the process. He said that people need to educate and promote an eco-friendly lifestyle to the young. With the help of Roosevelt University students, Milesh has been conducting some reading workshops with neighboring schools to help spread awareness about being green. Milesh plans to release a children’s book called “Ghaby’s Organic Garden” which will help teach kids the benefits of being green and the importance of nutrition. Since the organization was only founded in the past year, no projects have been comnpleted yet, as Ghabit is still in the planning process. However, in addition to the children’s book, Ghabit plans on executing some of the garden plans that they have been organizing for the Roosevelt campus and neighboring Chicago communities, sometime this spring. Milesh hopes that Chicago can be a launch pad for a nation and even worldwide movement. The Alliance for a Greener South Loop is another non-profit organization in Chicago that has been making a difference. The organization sends an electric news letter to companies, residences, and restaurants throughout the South Loop to encourage them to become greener. Whether it is by recycling or taking action to provide more gardens within the area, the Alliance is constantly promoting others to make more eco-friendly decisions. Since the Alliance is nonprofit and strictly volunteer, it relies solely on the contributions and efforts of those willing to give back to the community. The organization targets and spreads awareness to residential and business buildings that could improve on being greener. The Alliance holds an annual award ceremony, the “Greener Awards” in which they recognize institutions, businesses, residential buildings and people for their efforts in making the South Loop greener. These awards are given by the Alliance and publicly acknowledges those who have been making an eco-friendly change. Alex Borgen, a graduate of Columbia University and 2012 Green Heroes awardee, was recognized by the Alliance for designing and planning the “Papermaker’s Garden” in Columbia’s South Loop campus. Not only does this garden help air pollution, but it has also been utilized by the college to teach students how to make eco-friendly paper from the fibers of the plants. “That is such a huge undertaking, we really need a critical mass of interest and volunteers before we take that on,” she said. In 2000, Mayor Daley implemented a green roof atop the city hall. This sparked a rooftop garden movement throughout many buildings including the Sears Tower. These gardens help decrease the amount of pollution in the air while giving the residence a peaceful place to relax. Overflow Coffee Bar has joined the movement to make and encourage more environment friendly decisions. Amanda Neely, co-owner of Overflow, said the shop encourages people to either bring their own mugs or use one of our mugs rather than a paper cup and a sleeve and a lid. In return, customers get a discount. All of the products at Overflow are all natural and organic. All of the teas are organic as-well-as the methods for the coffee beans. The food products are all from local farmers and bakers. This saves energy from importing fruits and veggies while supporting local businesses. 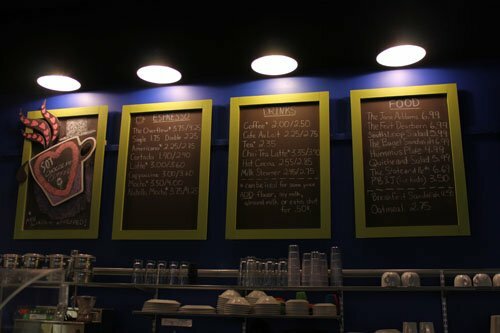 Since Overflow is located close to Columbia College, they try to encourage the students and teachers to come to their greener coffee shop by providing discounts.